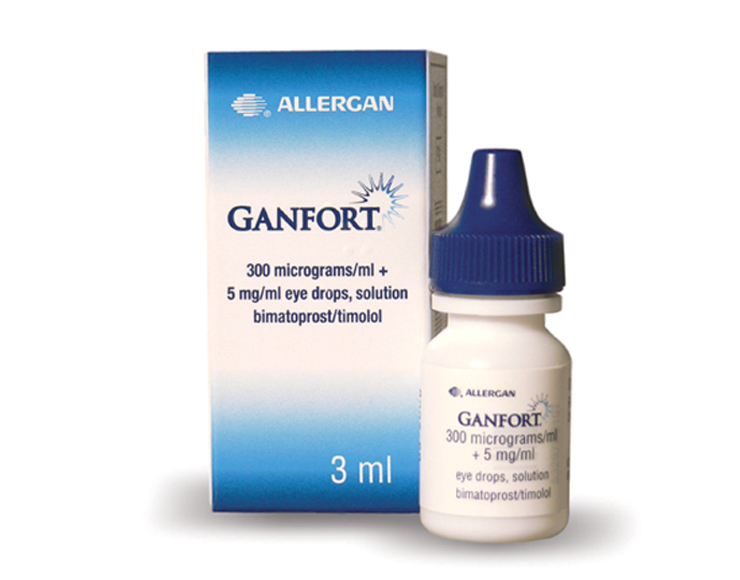 GANFORT® is an eye drop that is used to control glaucoma. It contains two different active substances (bimatoprost and timolol) that both reduce high pressure in the eye. Bimatoprost belongs to a group of medicines called prostamides. Timolol belongs to a group of medicines called beta-blockers. GANFORT® is prescribed to reduce high pressure in the eye. Always use GANFORT® exactly as your doctor has told you. You should check with your doctor or pharmacist if you are not sure. The usual dose is one drop in the morning in each eye that needs treatment. However, your doctor may recommend you apply the drop in the evening instead. Other ingredients are benzalkonium chloride (a preservative), sodium chloride, sodium phosphate dibasic heptahydrate, citric acid monohydrate and purified water. Small amounts of hydrochloric acid or sodium hydroxide may be added to bring the solution to the correct pH level. GANFORT® ophthalmic solution is supplied in 5 mL sterile plastic dropper bottle.